Extend the life of your chain by adding a roll ring chain tensioner to your conveyor design. These subtle yet effective parts relieve chain tension between two gears or sprockets. You won't see rapid wear or stretching occurring away from the sprockets anymore. The roll ring conforms to the design and even takes on reverse modes. At USA Roller Chain, each industrial roller chain tensioner is carefully designed and tested. Regardless of your system's specifications, including expansion forces, we have a drive chain tensioner to suit your application. There's a level of flex to an adjustable chain tensioner that offers so much versatility during an average factory day. The tensioner moves with vibrations that are inherent to the system. It essentially finds the sweet spot of your operation and moves with it. Trust in our tensioners that have durable construction and design expertise. Your system will hum along at peak efficiency. The roll ring tensioner design is very simplistic yet extremely beneficial and useful. Everything from the base material to the durable construction and design has been heavily engineered for maximum performance. USA Roller Chain and Sprockets prides itself as a source for the Roll Ring Tensioner. Not only do we have a direct US inventory, but we also have extremely competitive and fair pricing. These tensioners are available for roller chains in compliance with DIN 8187, ISO 05B-1 to ISO 20B-1, as well as ANSI B29.1 #35 - #100 side chains. Something else notable about this chain tensioner is that it is resistant to ultraviolet rays, radiation, abrasive environments and chemical change in vacuum environments. The below chart shows the standard roll ring tensioner sizes. Each part number is a direct clickable link to the product page itself. 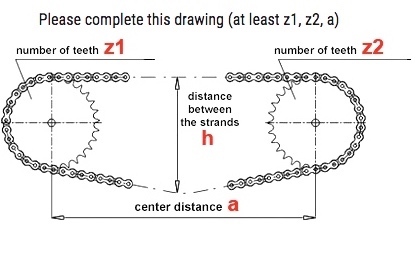 The material of the roll ring chain tensioner is a high-capacity elastic that consists of a hard yet flexible framework. The forming of roll rings consists of three components: elastic, viscous-elastic and plastic. The elastic component determines tension when in use. The roll ring is constructed in a way that the forming takes place in the elastic range only. When it comes to wear life, the roll ring tensioner is probably the longest-lasting chain tensioner in the industry. When testing a new, unused roll ring tensioner in comparison to one that had been in normal operation for 31,500 hours (both were from the same batch), the used roll ring only reflected a spring constant 3% higher after 31,50 operating hours. There are no indications that point to the end of the tensioner’s life due to normal wear and tear from operating. The image below on the left is a cutout from the used roll ring tensioner while the image on the right is a cutout of the unused tensioner. Please note that this specific tensioner was tested and used at the Frankfurt main airport luggage conveyor. The roll ring tensioner has been successfully used in a wide range of applications, including printing machines, airports, cleaning systems, breweries, aluminum processing plants, power plants, sandblasting machines, agriculture, mining and so much more! Something else that really sets the roll ring tensioner apart from other roller chain tensioners is the wide range of installation configurations for it. This makes it extremely versatile in non-standard applications and can save time, money and headaches when engineering a new drive or when looking for a chain tensioner that will meet your exact needs. Purchasing one of these chain tensioners is really quite simple. Just give us a call or send us an email! If you'd like to speed up the process, please provide the following information if possible. This will ensure you are receiving the exact roll ring tensioner you need. Besides the roll ring tensioner, we can also supply the required roller chain, sprockets, bearings, drives, belts and more. For additional information, or to get a formal quote, please contact us and we will be happy to assist you.